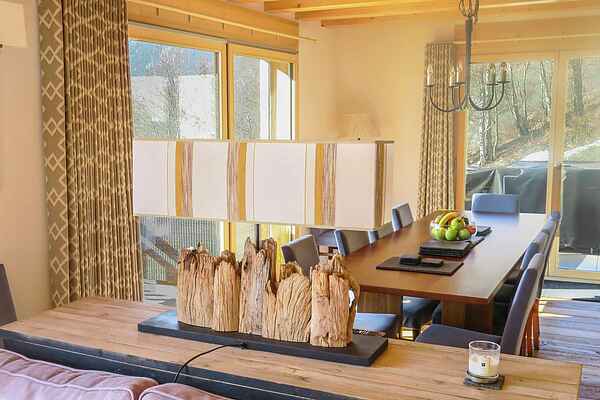 Unique luxury chalet, newly built, in the ski area of ​​4 Valleys, just 2 minutes from Express chairlift and car park. The very high quality and tastefully furnished chalet has an open fireplace, an outdoor hot tub (free of charge) and free WiFi. The spacious, open living / dining room is flooded by light. The kitchen is modern and fully equipped with Siemens appliances and a modern wine cabinet. There are 5 bedrooms and 5 bathrooms, one with a bath tub, the rest with showers. All beds are 2 m long. There is a ski rack and a ski room with boot dryer. The balconies -with many seating options- offer breathtaking views of the surrounding mountains. The heat supply is partly ensured by a modern and environmentally friendly geothermal system. The chalet is easily accessible; it is the last house of a dead end. It is located about 1.5 km from a small supermarket and a restaurant. The distance to the larger resort of Les Collons is around 4 km, with shops, restaurants, pubs, ski rental, ski school, bank, post office. Indoor and kindergarten (18 months) are in Thyon 2000, about 8 km. The City of Sion, with a historic Old Town, about 18km.